This free political map of South America shows mainly boundaries and some political areas, major cities and other selected data, which are characteristic for South America. Political map should help you to find your way through this part of the world and choose all the cultural and architectural attractions which will make your visit here interesting. 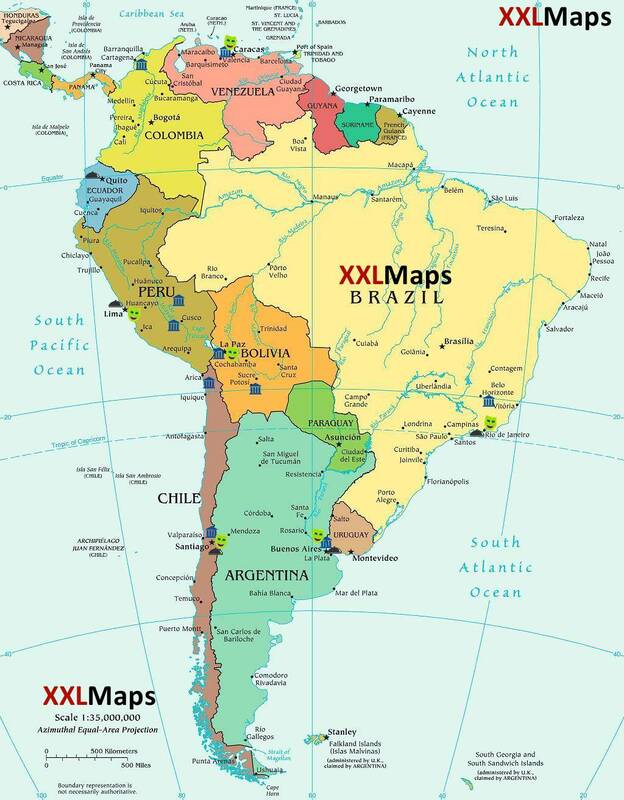 Let us add that South America certainly offers many more interesting places and we will keep preparing more free maps that give you more detailed information about them - to help you plan your holiday. And what beautiful places South America offers? Here are just a few examples: South America is full of contrasts: between the new and the old, between rich and poor... Take a look at all these famous cities: Buenos Aires in Argentina, the city of tango and rich cultural life, Rio de Janeiro in Brazil, the city of carnival, Santiago de Chile with many museums, theaters, restaurants and other entertainment opportunities... And here is Peru, the historic heartland of the famous Incas empire with sights like Machu Picchu and the Nazca lines. Historic places, bustling cities, colonial atmosphere, good food - this is South America.These are, however, just selected cultural and architectural beauties of South America. But if you decide to go there, you will find that there are many natural beauties that are worth seeing also. And experiencing them firsthand. Many of them can be found here on other maps.